An Integrated Biometrics White Paper. 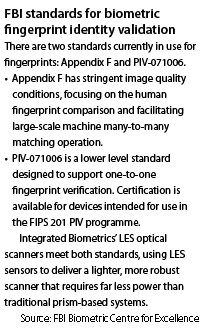 Not all optical biometric fingerprint scanners are created equal. The type of sensor used has a powerful impact on speed, accuracy, reliability and portability. Most scanners rely on fragile, heavy prism assemblies to generate high-quality images. This whitepaper introduces Integrated Biometrics’ Light Emitting Sensor (LES) optical technology and demonstrates how it creates faster, more reliable results than any other fingerprint scanning system currently available. Integrated Biometrics sensors use LES film – a patented electroluminescent polymer – rather than prisms to generate exceptionally high-resolution scans when touched by one or more fingers. The conductive properties of a finger energise particles of dielectric phosphor suspended in the thin film substrate. The luminescent glow of the phosphors produces an exact image of the fingerprint. LES sensors are optical devices that fully meet the standards for electro-luminescent (EL) optical imaging, as determined by the United States National Institute of Standards and Technology (NIST). Page 14 of NIST Special Publication 500-280v2 defines the EL optical direct imaging used in LES as: A contact technology in which the ridges and an Alternating Current (AC) signal cause an EL panel to emit light which is captured by an imaging system. The LES sensor generates the light needed for the scan, rather than a complicated assembly of platen, light source, and prism. The resulting image is captured using digital camera optics. LES sensors require far less power than prism-based systems. They are thinner and lighter, making LES the ideal medium for portable scanning systems. LES is unaffected by oils from previous fingerprints, dirt, heat, or cold. Operators can use LES sensors in a wider range of operating conditions, without having to clean the sensor between scans. This superior performance generates high-resolution optical scans that are FBI-certified (Appendix F and PIV), ensuring products that meet or exceed this ‘gold standard’ for biometric fingerprint validation. LES delivers these scans extremely rapidly, with built-in testing to eliminate spoofing and other attempts at fraudulent validation. Integrated Biometrics’ LES-based sensors generate high-resolution fingerprint scans by using energy to excite phosphorus particles suspended across a thin film substrate. The electroluminescent particles’ light emission varies, based on a finger’s ridges and valleys. Contact with the sensor therefore produces an accurate, high-resolution image of the fingerprint (Figure 1). Unlike glass-based sensor systems that require significant amounts of light to create a scan, LES sensors need only a small amount of energy, plus the conductive properties of a human finger placed on the sensor’s bezel and platen, to excite the phosphor particles in the film. The result is an image so detailed that even sweat pores are evident within a fingertip’s ridges and valleys. High-speed digital cameras capture these high-resolution images. Either a CMOS camera with a traditional glass lens or thin film transistor (TFT) camera, depending on the intended use of the scanner. Since LES sensors rely upon conductivity from the bezel across the finger to the platen to generate an image, LES scanners automatically position fingers for optimal scanning and maximum surface area. Any attempt at spoofing using non-conductive materials is automatically rejected, since no image can result (Figure 2). Image files transfer to host PCs, tablets or smartphones using an ordinary USB interface. This connection also acts as the sensor’s power source, removing the need for a separate wired connection or battery pack. LES scanners can operate for hours using a cellphone battery without additional auxiliary power, making this technology ideal for field operations using smartphones and tablets. 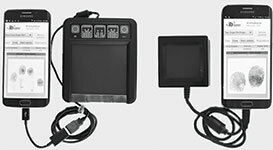 Integrated Biometrics’ LES sensors deliver reliable, 500ppi FBI-certified optical fingerprint scans in compact devices that are more portable than any other scanners currently available. 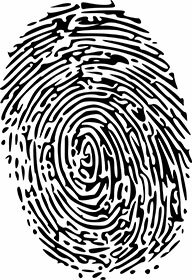 Integrated Biometrics’ sensors automatically enforce proper scanning position for the maximum surface area across one or more fingerprints. They enrol or scan multiple fingers quickly (2fp and 442fp), without requiring the surface to be cleaned between scans. LES sensors recognise the topography of a finger using the conductivity properties of human skin, rather than the surface image generated by backlit glass platens and prisms. This difference in functionality helps detect and reject spoofing and other attempts at evasion. 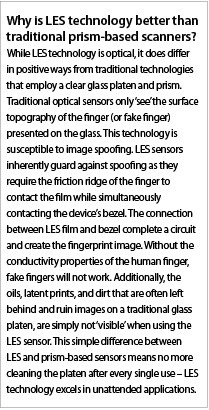 Since LES sensors use a thin polymer film rather than heavy, fragile glass surfaces and complicated prism assemblies and light sources, fingerprint scanners using LES work in extremes of temperature, dirt, glare, and humidity where other technologies cannot. The scanning surface itself is resistant to minor abrasions, and there are no light sources to burn out and replace. Low energy consumption makes LES sensors ideal for portable applications, drawing power through the USB connection of a typical smartphone or tablet. 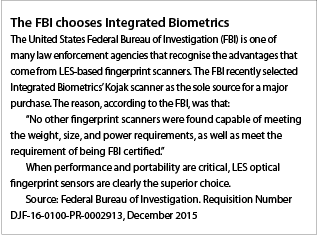 Integrated Biometrics is the first, and the only provider of FBI-certified optical fingerprint sensors using LES technology. Its superior performance, durability, light weight and low power requirements have made it the obvious choice for federal, state and local law enforcement and border control agencies, as well as handheld device manufacturers seeking a better solution for biometric identity validation. Today’s heightened security concerns and performance requirements demand a smarter approach to optical fingerprint scanning. Integrated Biometrics’ LES-based sensors meet that requirement.